I’ve been doing some tests with smoke simulation lately, and I met an interesting case I’d like to share. After doing some simple smoke emissions, I tried to get smoke trails. For unknown reasons a flickering was ruining the shading, no matter which resolution I was baking the simulation. I showed the file to Daniel Genrich (Genscher) and Miika Hämäläinen (MiikaH) who provided a fix and a simple explanation. The flow object Absolute Density had to be turned off and the Density parameter had to be turned down from 1 to 0.3: this prevented emitted particles to overlap in space and generate part of the flickering effect. For the Domain object, the “color” texture had to be tweaked so that in the Voxel Data panel the source appeared to be Heat instead of Velocity. This changed massively the quality of the simulation, which then I baked at high resolution. You can compare the results in the following video (there were some caching issues, so the final part of the sim is not complete), and you can also download the files if you are interested in the settings. Youtube link shows as private for me. Nevermind, now it works (don’t know why it didn’t 10 seconds ago). The flickered one looks better (high smoke density is more convincing), I hope you’ll find a fix! Personally, I would love to see the functionality needed to render this puppy in Cycles if doing such a thing is possible, I would imaging the simulation would render in a more realistic fashion as a result due to the smoke then being able to receive environmental and indirect light. There was a youtube video that showed GPU smoke rendering at a rather impressive speed for path-traced volumetrics, so I hope the current work from storm_st will at least give Brecht a starting point for the volumetric implementation. Are you guys using Lamps for the integration of CG objects with footage? Or are you using Emit Meshes? I also think that the flickering one is more realistic, it looks really cool that the flame is inside the smoke. On the second one the gradient from yellow to black is too smooth. I hope that the flickering can be fixed! Actually I think the flickering effect is quite good, if a little too much in the video. It gives the impression of something on fire in the centre. Maybe you could try introdcing a subtle flickering back into the smoke and see how it looks? Not only the flicker but the dispersal of heat (light) in a random manner through the smoke. Billowing smoke seems to have different densities(?) or fluctuations of heat moving through. So the newer version is a bit to homogenus. It would be great if Blender would get some nice fake smoke that would render way faster… like a sprite/billboard setup (presets) like Trapcode Particular in After Effects. This would be sufficient for probably 90% of smoke simulations. Real 3D smoke is only really necessary if you plan on passing through it. All of the people saying the first one looked better/more realistic: you’re on crack. The elements/fragments of burning whatever coming off of the fireball would burn from yellow to red to black as the turned to char. They wouldn’t immediately turn to char the way that the first example shows. 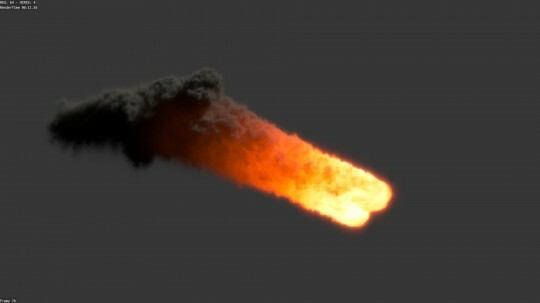 A burning fireball leaves a trail of smoke as it burns. I would love to look at your example files, but your link leads to a 404. Could you fix the link so I can study your work? Does anybody have a blend. file for smoketrail example? Unfortunately this above doesn’t work. Any chance to get smoke_trails.zip somewhere?